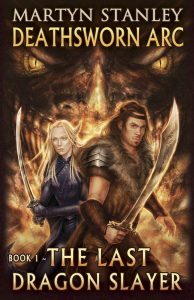 Martyn Stanley is the author of 'The Deathsworn Arc' a epic fantasy adventures series dragons. He lives near the Staffordshire/Cheshire border in England, with his long suffering wife and two small children. Martyn has always enjoyed epic fantasy novels and began reading them at a young age, starting with 'The Hobbit', ending with 'The Inheritance Cycle' and including everything in between. His 'Deathsworn Arc' is more than a hack and slash, swords and sorcery series. It examines, faith, companionship, morality, pragmatism and more. If the characters of 'The Deathsworn Arc' come across as strange, it's partly because they're intended to. It isn't a series which will be dragged out indefinitely, it has a beginning, a middle and a definite end. He already has the plot for his second series forming in his head. To write is to create characters and to have freedom for them to succeed or fail and to travel wherever you want them to, and meet who ever you want them to meet. He sincerely hopes you enjoy reading his epic fantasy adventure series 'The Deathsworn Arc' as much as he enjoyed writing it.